Made from heavy-gauge, shatter-resistant frosted polypropylene, this A4/foolscap clipboard is both robust and long-lasting. Its extra-strong, high-capacity clip allows it to grip paper firmly. 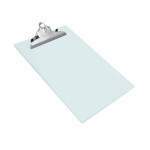 This clipboard also features a hanging hook for practicality and ease of storage. Pack contains 1 clear board.